Theory Aesthetics — Vitamin C, Peptides + Growth Factors - The Trifecta ▲ For Skin Longevity Part 1. Vitamin C, Peptides + Growth Factors - The Trifecta ▲ For Skin Longevity Part 1. Are you looking for a simple understanding so you can better choose your skin care regimen? We have targeted three ingredients that you should include in your at-home arsenal that is essential for skin health. The three power-packed anti-aging ingredients include Vitamin C, Peptides and Growth Factors. During the course of the next couple of weeks, we will have a series of educational blogs to provide you info on these ingredients. We will also tie each ingredient with the skin care product that has received excellent reviews; therefore, not only do we offer in-house services but also recommend you try it for yourself. 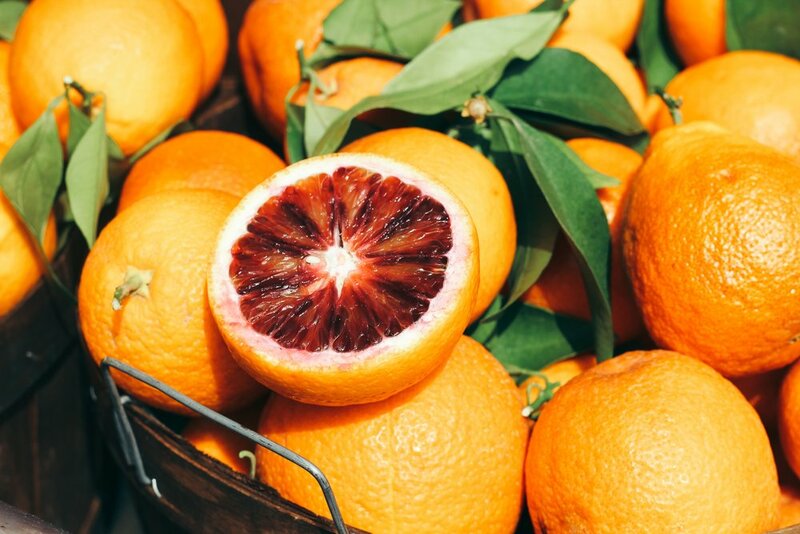 Oranges have always been associated with Vitamin C. Since childhood it has been instilled in us to eat oranges in order to get your Vitamin C. However, there are many fruits that contain more Vitamin C than oranges. Although refreshing, we don’t have to consume them to enjoy the benefits. So what is so important about Vitamin C you may ask? Well, first off, Vitamin C is water-soluble and found in certain foods as our bodies do not produce it on it’s own. Vitamin C is also known as L-Ascorbic Acid in the medical and scientific community. For those of us who are uninterested in scientific terms or can barely pronounce them, we like to keep things simple. Vitamin C's role is to help aid in the production of collagen. Collagen is a type of protein needed to help protect us and to keep our bodily tissues vital. These vital tissues include our skin - the largest organ of the body. Tendons, ligaments, blood vessels, bones, and cartilage also requires protection and Vitamin C helps in regeneration. When we age our bodies go through a degeneration process so it is important that we take care of ourselves. Vitamin C essentially is an aid to help tissue growth and repair not only internally but externally too. It has antimicrobial properties and can help combat acne breakouts. Another benefit of Vitamin C is its Antioxidant properties, fighting free radical damage and photoaging. Vitamin C is also helpful in boosting metabolism and we all know that it builds immunity to help fight the seasonal cold. PRO-HEAL SERUM® ADVANCE+® features scientifically advanced L-Ascorbic acid (Vitamin C), combined with a superior form of Olive Leaf Extract and pure Vitamins E and A. This powerful formulation significantly increases antioxidant protection while helping improve the appearance of compromised, blemish-prone, and aging skin. iS Clinical PRO-HEAL SERUM® ADVANCE+® leaves your skin feeling super supple. If you happen to suffer from dry/dehydrated skin or sensitivity, this serum will help. With the weather changing this will also help with seasonal dryness. Another favorite Vitamin C product is Image Skincare's A.C.E Serum which is a combination of Vitamins A, C, and E. The entire Vital C Line is simply amazing and is great for all skin types and conditions, including aging, sensitive, dryness, rosacea, hyperpigmented and acne skin. Look out for our subsequent blog, specifically, on Image Skincare. We will endeavor to provide you with a breakdown of all Vital C's counterparts. We also plan to do a giveaway of a trial kit of The Vital C Collection so stay tuned! Finally PCA Skin is another one of those lines that you just cannot go wrong with. This line is one of our go-to's and we especially love the C&E Strength Max which can be used with a daily moisturizer. This is a good alternative for those who may have reactions to Vitamin A. This corrective daily serum can also be used with a night cream and has a potent blend of 20% vitamin C with 5% vitamin E. Like all good Vitamin C products it works to diminish hyperpigmentation, protects against free radicals, and will help aid in collagen production. If you have a question about any of the product discussed you can contact us at 404-496-4091 or email us at info@theoryaesthetics.com. We also encourage you to book a skin consultation whether over the phone, virtual or in-clinic. We love to talk skin. We also invite you to visit us at www.theoryaesthetics.com, follow us on our Instagram and Facebook for latest Theory Aesthetics updates, current and new service offerings and promotions. In addition, we would love to share our passion with you and invite you to schedule a procedure with us. Now and during the holiday season, we are offering all single service treatments at 20% off. We are also offering 10% off all our service packages now until December 30th. Come meet + Grow with us.